Amongst the public struggle taking place for America’s soul there are still anchors, an echo here of Whitman, the tender machinations of Scarlett and Rhett, a black and white image taken in a one horse town where the no speeding signs are placed back to back. 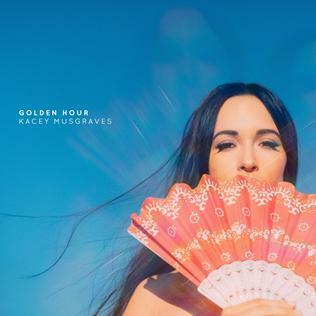 This is not so say that Kacey Musgraves fourth album is at all suffocated by the cloying sentimentality which sometimes comes with the territory of country music. Having recently married, Golden Hour finds the Texan this time writing songs with more heart than break, an approach best described as somewhere between Taylor Swift ex the fearful contrivances and a Nashville raised Haim without their suburban Fleetwood Mac fetish. It’s star is Musgraves lush, eddying voice, but equally the astute simplicity of her work lies in brain-hijacking wait for the unwary. There are pitfalls aplenty here of course for anyone not taking note of the genre’s implied fabric, but only once, on Velvet Elvis, does she fall into the trap of box ticking for traditionalists. Elsewhere in the titular opener, Lonely Weekend and Butterfly she opens up a bottle of humble but exquisite pop that should remind listeners that bumper stickers, picket fences and rusty autumns are not the only reasons to still love at least a part of our American dreams.